In the parish I serve the setting of the Gloria in excelsis sung in Eastertide is Hymn 421, ‘All glory be to God on high’, Bland Tucker’s metrical version set to Nicolaus Decius’s tune for his own adaptation, ‘Allein Gott in der Höh sei Ehr’. As it turns out, this Lutheran adaptation of the Gloria was first sung on Easter Day in another year when it fell on 5 April: 1523. On that day 492 years ago, at Braunschweig, the Low German original of this hymn, ‘Aleyne God yn der Höge sy eere’, was sung publicly for the first time, coupled with its author’s adaptation of the ‘Et in terra pax’ portion of the tenth-century melody for that Canticle traditionally appointed for Eastertide (from the Missa ‘Lux et origo’). Decius was one of the first, if not the first (his hymns apparently predate Luther’s own first effort by a year), of the German Reformers to take up the task of finding ways for the whole congregation to sing more of the liturgy. He and others made vernacular strophic, syllabic-metrical paraphrases of many of the fixed parts of the Mass and Offices – the Kyrie and Gloria, the Nicene Creed, the Sanctus and Agnus Dei, the Pater Noster, the Magnificat and Nunc dimittis, and so on, drawing upon existing Latin hymns and chant tunes, popular religious song, and even secular materials for their musical settings (expanding and adapting the texts of popular religious songs was also a fruitful endeavor). Decius also made an enduring version of the Agnus Dei (‘O Lam Gades vnschüldich’ / ‘O Lamm Gottes, unschuldig’) and wrote a Sanctus version, ‘Hyllich ys Godt de vader’ / ‘Heilig ist Gott der Vater’. alle veyde nu hefft eyn ende. wol vns des fynen Heren. Dar tho wy vns vorlaten. uns rühren kan kein Schade. all quarrels now have an end. wohl uns des feinen Herren. happy we, for our great Lord. god hath put out all enmyte. graunt vs thy mercy altogether. And strength alwaye oure weake bodies. This, of course, had little currency, as Calvinism gained a great deal of influence on the Church of England and metrical Psalmody became the norm for congregational singing until the nineteenth century, since which time ‘Allein Gott’ has been translated into English a number of times. Tucker’s text, however, is less a translation of Decius than a metricization of the text of the Gloria itself – much close to the original, and in a couple of ways closer even than the icet / ellc prose version – making it a suitable version for use in Eastertide or at any time. þat rightwis are, & of gode wille. oure god, oure fader almyghty. & son of god, þi fadir fre. bot of þi selue, & lord alone. thorght prayere of þi modre, amen. 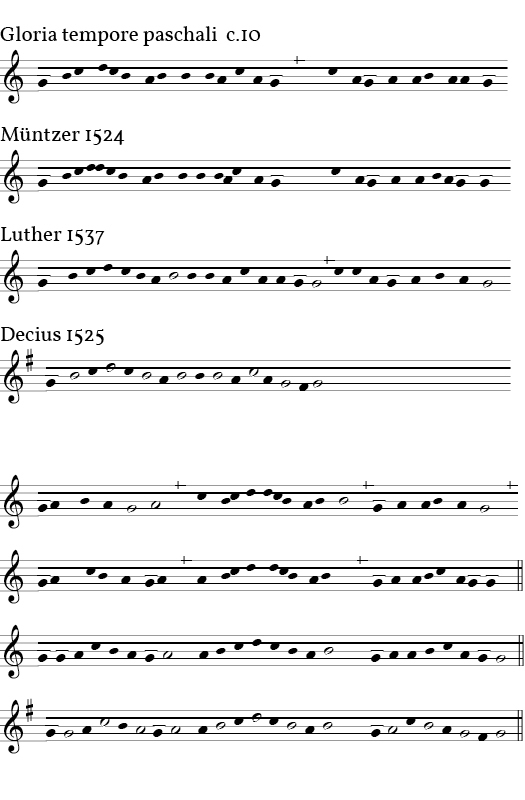 See the Resources page for my own adaptation of the same ‘Lux et origo’ melody intended for use with the Hymnal paraphrase, which can be used instead of, in or alternation with, Decius’s rhythmic tune.